Comments: During "Out Of Control," Bono tells the audience that his brother Norman is at tonight's show and thanks Norman for giving him (Bono) his first guitar. 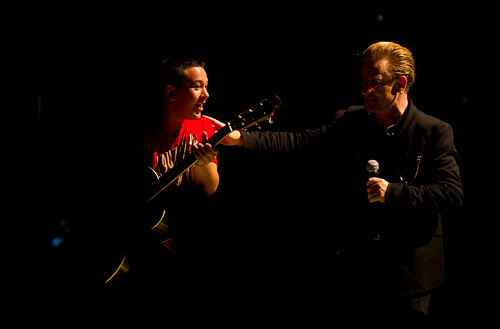 Bono brings a young fan named Brian on stage to play acoustic guitar during "Angel Of Harlem," and when the song is over, he lets Brian keep the guitar. After that, the show pretty much gets turned upside down, as if someone did a cut-and-paste job on the normal setlist. After "Every Breaking Wave," the band launches into "Bad" instead of "Bullet The Blue Sky," which is normally played in this spot. During "Bad," Bono tells the audience that it was 30 years ago to the day that U2 did this song at Live Aid (he's off by a couple days; it was July 13, 1985, not July 11) and he does a couple snippets of "Walk On The Wild Side" -- a song he also snippeted at Live Aid. That leads into "With Or Without You," which has been the last song of the second set throughout the tour, and then "City Of Blinding Lights," which has become the standard first song of the encore. After all that, the second set returns to a bit of normalcy with "Bullet The Blue Sky," "Pride" and "Beautiful Day." During "Pride," the screens again show the #BostonStrong hashtag. An early version of the show's setlist includes all of the changes above, but also has "The Troubles" as the final song of the night, after "One." But the printed setlist at the show, with all the production cues included, didn't have "The Troubles" but did list "I Still Haven't Found What I'm Looking For" before "One." We have 2 reviews and 2 photos from this show.